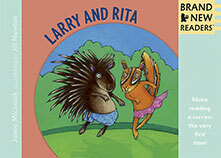 Things get a bit prickly when Larry the porcupine dances with Rita the chipmunk — or when they engage in beach adventures, bubble-blowing, or bottle tossing at the fair in these four funny tales with a final twist, perfectly suited for first-time readers. A lively porcupine and chipmunk make a fun-loving duo — and a vibrant addition to the Brand New Readers series. 48 / 7 7/8" x 5 1/2"